Wow, it has been a long time since I've posted, hasn't it. I feel like I ran out of ideas of things to create - I also ran out of time to create. We've started our new year of school and I am teaching two highschoolers! I am beyond busy! 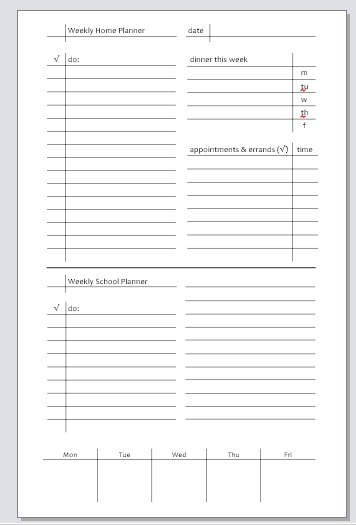 The printable I am sharing with you today is something I made to help me in my everyday school and home plans. The appointments still go on the monthly calendar and the things to do have been going on the daily pages, but since I keep my lesson plans with my everyday planner, I needed to have something front and center so I didn't have to keep flipping back and forth from my lesson plans to my weekly or daily pages. This is what I came up with. I love this one! I just started college (again...and again...and again) and couldn't find a good page to put in my planner to keep me and mine under control. Kids are grown and gone, but hubby and I get pretty confused with our lives. This will at least help me organize part of my life. THANKS!! !